Traffic Logix recycled rubber traffic calming solutions are an effective, visually attractive, and environmentally conscious way to slow cars down and save lives. Made of 100% recycled rubber,* these traffic calming solutions get old tires out of landfills and back into use. The Traffic Logix rubber solutions are customizable, easy to install, comfortable to drive over, long-lasting, and highly effective in slowing cars down. Curbing solutions, including the SuperFlex curbing and CycleLane delineators offer additional methods to create safer roads. You can use them to create traffic circles, chicanes, road narrowing, and protective bike lanes to keep pedestrians, bicyclists, and drivers safe. Traffic Logix speed humps, cushions, and tables are all made of interlocking units that simply snap together and are bolted into place. They can be expanded to any road width or solution length for endless configurations that fit your roads and meet your targeted speed goals. For optimal visibility, each solution includes highly reflective taping in stripes or chevron arrows in a choice of white or yellow. When cities use asphalt solutions, consistency can be difficult to attain and street resurfacing requires demolition and construction of new devices. 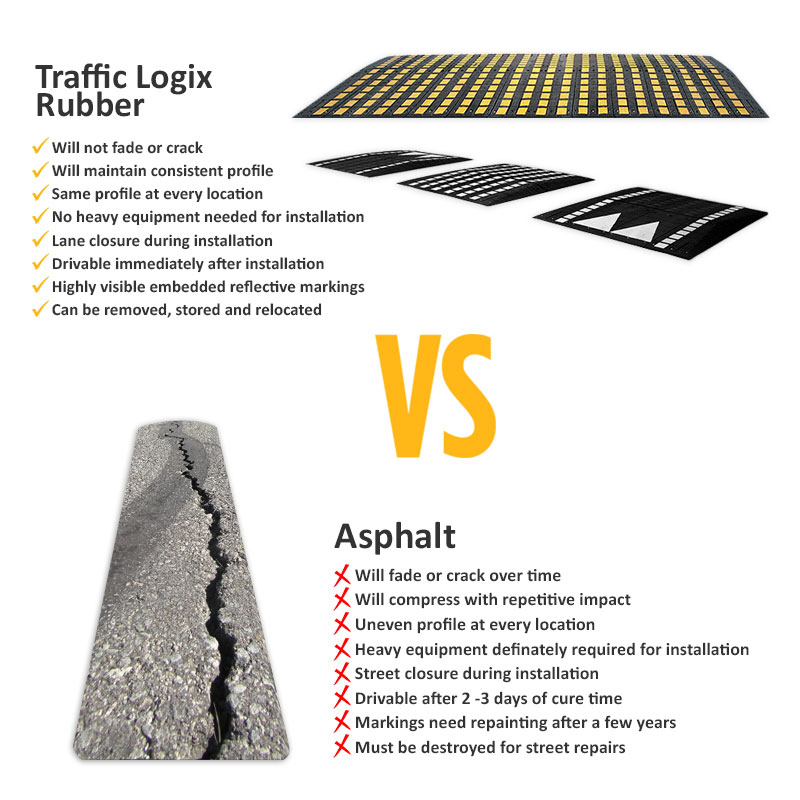 Traffic Logix pre-molded rubber solutions are consistent in shape for better driver acceptance, quick and easy to install, and can be removed and put back into place at the same or another location. They offer long-lasting low-maintenance traffic calming to prevent accidents and save lives.